Cold-pressed and hexane free. One softgel contains the equivalent amount of GLA as found in 3 Evening Primrose Oil 500 mg Softgels. 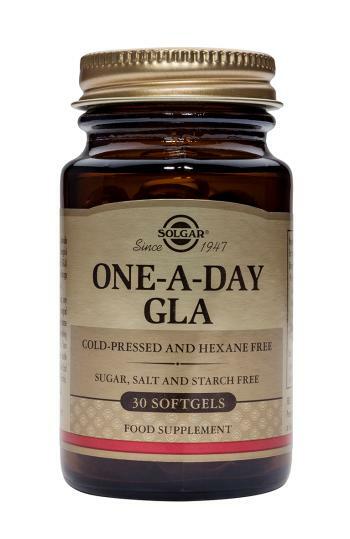 Solgar's One-A-Day GLA Softgel Capsules provide a high potency source of the Omeag-6 Polyunsaturate Gamma-Linolenic Acid (GLA) supplied as the cold-pressed oil from Borage seeds (Borago officinalis). Hexane (solvent free). GROWN WITHOUT THE USE OF HERBICIDES AND PESTICIDES. SUGGESTED USE: As a food supplement for adults, one (1) softgel capsule daily, preferably at mealtime, or as directed by a healthcare practitioner. Do not exceed directions for use. If you are pregnamt, nursing, taking any medication or have a medical condition, please consult your healthcare practitioner before taking this product.